1 Post By Alan F.
I have the original speedometer och tachometer on my CM400T. It idles good at around 1200 rpm but I suspect the rpm goes up too high when I ride. Does it? Ok, I understand I need to ride at high rpm but I found this info which made me wonder. LDR's bike with 17/35, tach is reading lower than original but I think the difference is big compared to my bike. That guy claims the recommended (on many sites) 1:7 ratio is too high. A swede I'm talking to on the internet says the same. Last edited by Chippe; 04-15-2019 at 12:08 PM. The way to get the correct engine to tach ratio will be to remove the left engine cover and disconnect the tach cable at the gauge end. Affix a pointer on the end of the cable and have someone hole it to count revolutions. Now manually turn the crankshaft a number of times, like 10. Might be easier with the plugs removed. Let's see if I understand you. I turn the flywheel 360 degress about 10 times and count the revolutions on the end of the cable? Can I adjust the original tachometer which I have or is it just to find out the correct ratio? I wonder if it's possible to have too high rpm at a certain speed. I think I've read about it on the forum but I can't find it. I would appreciate if somebody could give me rpm at a certain speed and gear. It doesn't matter if it's in MPH or KMH. Last edited by Chippe; 04-15-2019 at 02:44 PM. Thanks I understood I should devide it. That's great when you have to buy a new tachometer which I'm going to when everything is ok. I still think my rpm is too high based on the 4th comment. I found out that it could be a slippery clutch. Last edited by Chippe; 04-17-2019 at 12:53 AM. 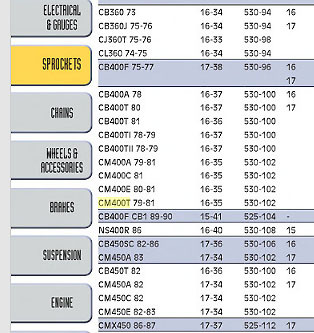 Sprockets are not the same on these bikes if this info below is correct and I have 36 teeth on the rear sprocket instead of 35 but it doesn't do much difference. Below you can see stock sprockets, my bike 16/36 and LDR's bike with 17/37. 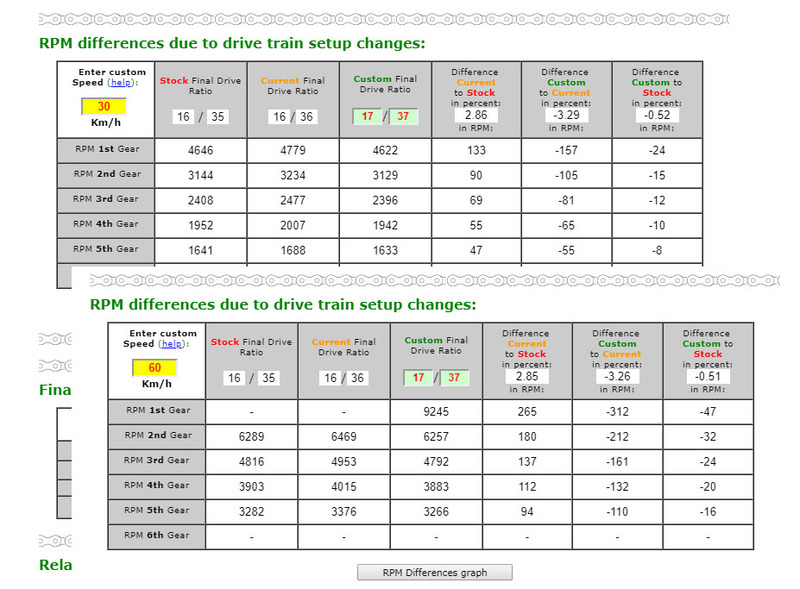 According to the info we're both off but somebody might have put in the wrong data. Last edited by Chippe; Today at 08:40 AM. I did what you said and made a video so now we all know. I think it was very accurate so only did 4 full rotations on the flywheel and Honda use as far as I know 1:4 or 1:7. I wonder why all the sites on internet say 1:7, maybe it's not the same on all models? 1:7 was too much on a CM400T 1980 and on a CB400N 1982. That's all I know. Last edited by Chippe; Today at 01:41 PM.